The company Entrada from Šusnjevica is owner of Labinprogres – Agricultural machinery factory since 2013. Company from Šušnjevica was established to offer machinery equipment and servicing. In two decades of existence it has grown to 11 employees with the business-sales center in Čepić and business centers in Sesvete and Zadar. Its offer includes products from the world’s most famous producers of agricultural equipment and it has expanded business with a consulting services, planning and design, delivery, deployment and user training. Italian company Lombardini, whose engines are installed in Labinprogres machines, entrusted Entrada as its general representative for Croatia, Serbia, Montenegro, Bosnia, Macedonia and Kosovo. Also, before the purchase of Labinprogres, the company was their largest authorized dealer for Croatia, whose distribution network today covers sixty wholesale and retail outlets. We talked with Josip Kontuš, director of the company Entrada. Continue reading to see what he’s saying about the trends of purchase of agricultural machinery, the expectations of the Rural Development Program and joining of Croatian farmers in machinery rings. The activity of the company Entrada Ltd. is related to the sector of agricultural machinery since 1992, when the company was founded. What are the goals of Entrada for the future? The goal of Entrada Ltd. is to become a regional leader in the production and distribution of small and medium-sized machinery. Are you satisfied with the current way of exhibiting machinery at the fairs? What do you think about Farmshow fair, which was first held last year in Osijek? Croatia is perhaps too small country to maintain such a large number of fairs that are unavoidable in the larger states. However, exposure at international Bjelovar fair remains a tradition of our company. I think that exhibiting at the foreign fairs is way to success because Croatian market is too small and only opportunity for development and growth of our business is outside the boundaries of the Republic of Croatia. The fairs are one of the most effective ways of penetration into new markets, particularly in the field of agricultural machinery. What machines usually buy Croatian farmers? Croatian farmers mostly buy tractor Tuber 40 and Tuber 50 with various attachments like trailer, loading baskets, etcetera. What do you think, are the Croats sufficiently organized in machinery rings? Unfortunately, not nearly as much as they should, in particular looking at the structure of farmers and the average size of holdings. The story with machinery rings is very similar to one with cooperatives that have completely unjustifiably lost their status. Instead of strengthening and contributing to the development of agriculture in Croatia, they have fallen into problems and stayed marginalized. We can say that along with objective and practical reasons for this condition, and these are primarily the lack of vision and a clear strategy for the development of agriculture in Croatia, as well as the lack of encouraging farmers to this kind of association, there are reasons that are difficult to quantify. We can relate these reasons to the way thinking of most of our farmers, we could even say the mindset or the generally accepted point of view by which this kind of association (especially cooperatives) have a generally negative sign and are associated with some history and way of functioning which originates from socialism. It is clear that this is quite unjustified and wrong, because a large part of the developed agricultural countries in environment base their strategy and success on some kind of cooperative or similar associations. They enable to small and medium farmers not only easier access to the machinery and attachments, but also a lot easier and more convenient purchase of raw materials, as well as sales of products on the market. Regarding the machinery rings in Croatia, they are in fact necessary. Looking from one side on the structure of the farmers, the size of their holdings and the need for specific equipment, and from the other side the development of this machinery, especially attachments that are more narrowly specialized, technologically advanced and more efficient, and therefore more expensive – it is clear that it’s difficult to connect the two sides. The individual small farmer himself cannot justify investment in such machinery, and without it, yet cannot be sufficiently competitive with its products on the global market. When you add the fact that a very large number of attachments are used only purposely to specific soil treatment or a culture, and that this lasts sometimes for only couple of days in the year, it is clear that the only formula that makes sense is to join farmers together and organize in a way that more of them use one machine or attachment. Do you think that the Croatian farmers need more education about the technology of modern agriculture? Absolutely. Without investment in knowledge and application of new technologies, it is impossible to make progress and be competitive on the global market today. This is the only way to catch up with the developed agricultural countries. I would dare to say and the key factor for the survival of agriculture in Croatia. However, it should be noted that it is not enough only to invest in the new technology of tillage, because we are unfortunately very far behind in all other activities such as irrigation, crop protection from the weather, transportation and logistics, and in particular the storage of agricultural products (refrigerators, special tanks for a particular culture, etc. ), soil fertilization based on an analysis of the soil and its chemical composition. Is sales falling comparing to countries of Ex-Yugoslavia?! 350 tractors are being sold in the whole country during the year, while in 2008 were sold more than 1,500. How to reverse the trend? The trends are negative, especially if you take into account that from 2008 up today is recorded continuing decline in sales of tractors. Even more troubling is comparison with neighboring countries, primarily with Slovenia, Macedonia, Bosnia and Herzegovina – where despite small numbers of agricultural areas and significantly disadvantaged structure is sold a significantly higher number of tractors per year. Unfortunately, according to this data, we are at the very bottom, even in comparison with countries of the former Yugoslavia. The comparison with EU does not even make sense. The main reason for this is that we are the only country in transition that since 2009 has not had specific incentives and subsidies for the purchase of new agricultural machinery, particularly tractors, and when this is combined with the global crisis, weak economic power of farmers and negative investment climate, results are the way they are. There are several ways to reverse the trend, but the incentive must come from the state, through programs such as the Rural Development Program, which is currently in progress with concrete measures (4.1, 4.2, 6.3), which will certainly have a positive impact on increasing sales of tractors and other equipment. The money from EU funds at our disposal should be maximally used and directed through appropriate programs to Agricultural Development and renewal of machinery that is largely outdated and inefficient. We never give up on investments in development! 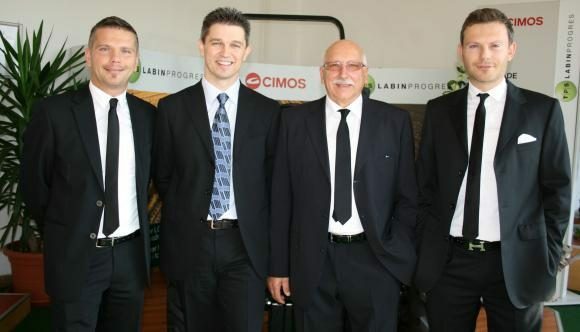 Labinprogres is the largest manufacturer of agricultural machinery in Croatia, with a tradition of over 40 years. What is the key of success? Labinprogres has products that are recognized and demanded on the market due to its quality and very efficient dealer-logistic network that is always at the service of the customer. The main characteristic of company is the fact that it has a clear vision and strategy of development. It’s based on long-term goals and two basic guidelines, that are breakthrough to new markets and continuous improvement and development of new products. This means that TPS in its most difficult times had not given up on investments in new product development, but moreover, we had increased it and intensified it. The company, along with numerous improvements, launches on the market at least two to three new products per year. Beside investments in the development of products, significant investments are made in marketing. Since 2006 we regularly attend the largest international fairs of agricultural machinery (Bologna, Hannover), and all our products are certified to the demanding EU standards and approved for the EU market. You won the prestigious Award for the promotion of Croatian olive growing. Do you have further plans of specializing in this sector? Prestigious award for promotion of Croatian olive growing, endorsed by olive growers around the coast and islands, obliges us to continue developing this program with more intensity, which is our long term plan. Today Croatia irrigates only about 20 thousand hectares. Do you think that the National Programme for irrigation could be more effectively applied? What are your experiences? We think that the National Irrigation Programme does not even apply. It is inefficient and almost all activities on the issue are not carried out or take place very slowly, with a large backlog and lack of planned funds. Unfortunately, the state here failed again because it had a primary role in the development and implementation of the National Programme for irrigation. As it’s well known, Croatia is rich in water resources and water supplies. It’s a pity that they are not directed and used for irrigation in agriculture. However, to make it possible, it’s necessary to bring water at agricultural areas. That was the prerequisite for implementing big infrastructure projects, the construction of reservoirs, canals and required irrigation network, which was not done. It was in a way the first stage in the implementation of a national plan – and, as it was not carried out, it is impossible to expect the implementation of the next phases. explaining through free training and seminars to farmers the potential benefits of irrigation and make, by concrete comparisons in difference in crop quantities, simple calculations from which will be seen benefits of investment in irrigation. What changes do you expect in work, now that the Rural Development Program is approved? We expect from the Rural Development Programme to finally start with its realization. After years of fasting, without incentives and subsidies, we expect that finally something will begin to happen in the equipping of agricultural machinery and accessories. Are you planning any innovations in terms of machinery – are there plans with some new tractors? We are continuously working in developing new products and attachments, so that our customers can have each year a new product or some novelty in their offer. Our decision to purchase Labinprogres strengthened its position as the leading manufacturer of agricultural machinery and equipment in Croatia and in the region.